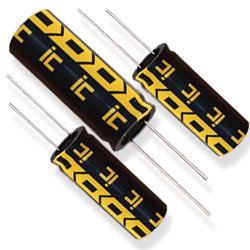 March 1, 2018 - New Yorker Electronics is now distributing the new Illinois Capacitor DGH Series 350-Farad Supercapacitors. This series continues a supercapacitor trend of incremental improvements, while achieving lower costs. The DGH Series includes 21 different value/voltage combinations, ranging in capacitance from 0.5F (Farad) to 350F, with voltage ratings from 2.7 to 5.5WVDC. ESR varies by part, but is notably lower than capacitors with similar storage capabilities. The operating temperature ranges from -40 to +65°C for extended life performance in countless applications. Like other IC supercapacitors, DGH supercaps provide engineers with interesting new design options. With their massive energy storage, they have the ability to provide instantaneous bursts of power to smooth power interruptions, supplement batteries or even be used in place of batteries in certain applications. DGH supercaps do not degrade with each cycle. At 2.7volts, operating life is rated at 10 years with 500,000 cycles. Applications for these supercapacitors include: energy harvesting, mechanical actuators, transportation power, smart electric meters, pulse battery pack alternatives, memory backup, battery/capacitor hybrids, UPS systems, emergency lighting, LED power, solar lighting or anywhere that significant energy storage is needed. DGH Series capacitors are offered with radial wire leads or snap mounts. Case diameters and configurations vary, depending on values. The parts are also fully RoHS compliant. Custom modules, with active or passive balancing, are also available through New Yorker Electronics, combining multiple capacitors for higher voltage or capacitance specifications. New Yorker Electronics is a franchise distributor for Illinois Capacitor and provides its full product line of miniature capacitors for electronics, lighting, energy and other markets including aluminum electrolytic, metalized film, power film, supercapacitors (ultra capacitors), supercapacitor modules and other types. New Yorker also supplies the IC RJD Series Rechargeable Coin Cell Battery.